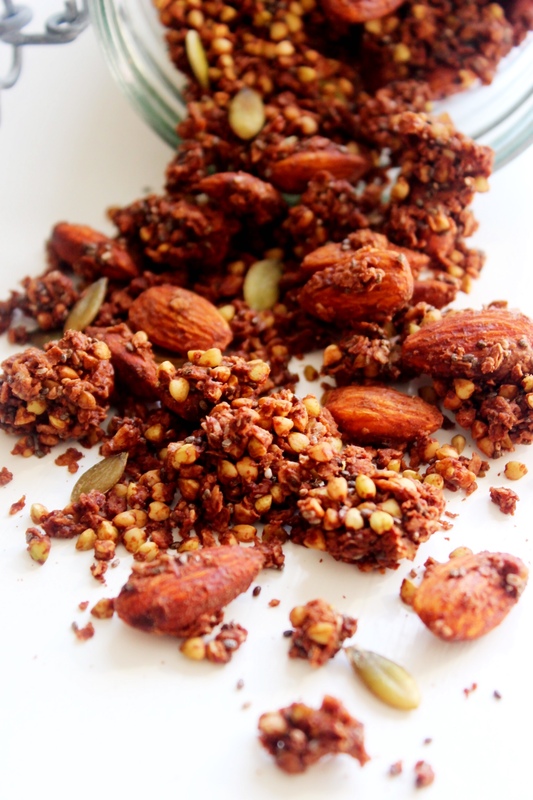 Buckwheat granola is so moreish because of it’s incredible crunchy texture and it makes such fabulous clusters. For this one, I’ve added in loads of raw cacao powder and sweetened it with maple syrup to make it chocolatey and irresistible. It’s full of fibre, protein and vitamin E from the gluten free oats, almonds and pumpkin seeds and to make it even more nutritious, there’s lots of chia seeds in there too which are full of Omega 3s. 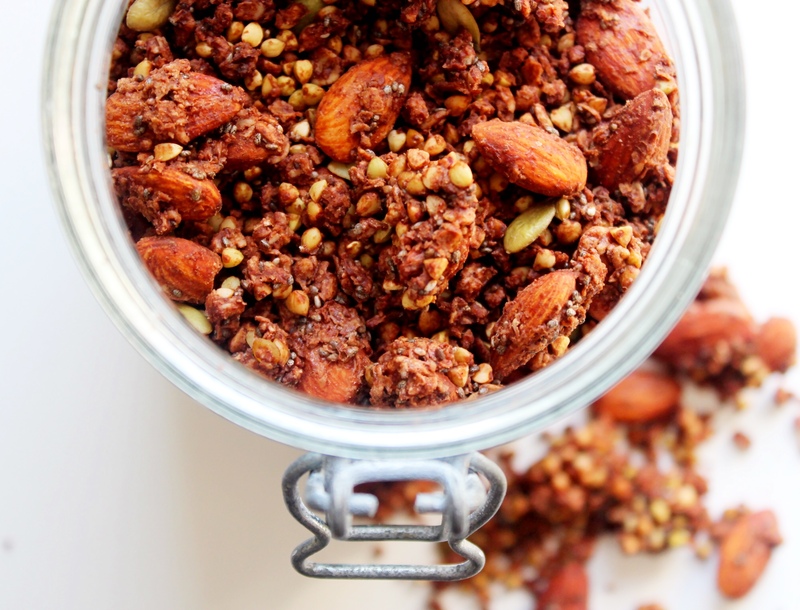 You can have this for breakfast or dessert or just snack on it straight out of the jar! 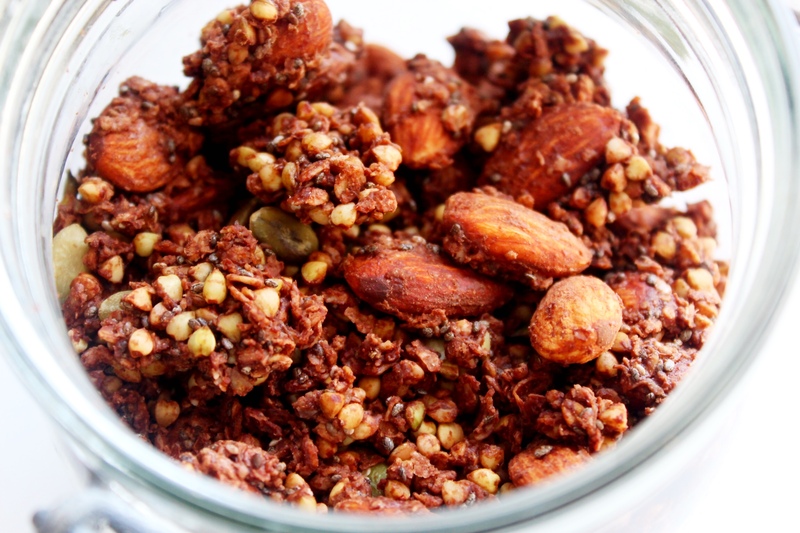 Combine the buckwheat groats, gluten free oats, chia seeds, cacao powder, nuts and seeds and mix until combined. Drizzle in the melted coconut oil and maple syrup and mix well. Spread the mixture out on a baking tray lined with parchment paper. Bake at 180’C for 20-25 minutes until crisp, tossing once in the middle. Let it cool completely and crisp into clusters before storing in an airtight container. Great recipe ….. How long should it keep? It tastes like healthy coco pops!! Yummy! Could you use agave syrup or honey instead of maple syrup? Hi is there a difference between buckwheat and buckwheat groats? I can’t seem to find buckwheat groats I can find buckwheat. Can I ask a silly question? Did you use cooked buckwheat or raw?